Rainer Werner Fassbinder | WHAT A FEELING! Veronika Voss is as appropriate a final film as one could hope for from the late R.W. Fassbinder. It carries a sense of decisiveness about it, a summing-up quality just right for a last statement; it also contains spooky connections to Fassbinder’s real-life demise, since Veronika Voss is a cinematic illusionist who becomes dependent on drugs, as did, tragically, the director. Everything seems elegiac: the exquisite black-and-white photography, the somber tone of the performances, the bleak absence of hope. 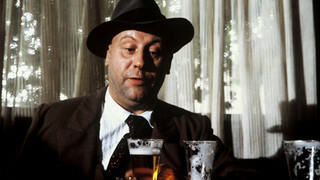 The clarity, the restraint, the sadness with which Fassbinder presents the story contribute to the sense of desperate finality; and his own brief physical presence in an early scene (peering over the heroine’s shoulder in a moviehouse) certainly seems, in retrospect, like a calculated farewell to the cinema, and to life. Leave it to Fassbinder—he would go and make one more movie before he ran out of breath last year, and make it as inappropriate a final statement as Veronika Voss is a fitting one. Querelle is a gaudy adaptation of Genet, with a flaming yellow-orange color scheme and determinedly artificial sets; it has the physical appearance of one of the Arthur Freed-Gene Kelly sailor-on-leave musicals as directed by Vincente Minnelli on hallucinogens. It’s anchors aweigh as Fassbinder brings the psychosexual tensions of the seaside town into seething life, and puts his odd international cast through close encounters of every kind. Brad Davis’s Querelle (and this problematic actor is much better than his on-set interviews in Wizard of Babylon lead one to expect) is the object of lust from every angle; Jeanne Moreau sings in the bar central to the action; Franco Nero smolders as the ship’s captain who must have Querelle. Much of this remains on a fairly enigmatic level, as least on one viewing, even with the guiding intertitles that flash up every so often. Most of it is rapturously heightened, with Fassbinder stubbornly caring about the goings-on in the tacky costumes and loud lighting. Some of it is superb. Maybe Querelle is the appropriate parting shot from Fassbinder after all: Fassbinder seemed to want nothing so much as to disturb us; in his films, when people start feeling comfortable, they start to fade away. Querelle may make you feel many things, but comfortable isn’t one of them. 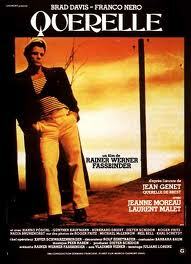 Querelle rocks the boat. A zany movie. Can’t imagine watching it again, but I said that about Satan’s Brew too, and darned if it didn’t look better on a second viewing. Maybe Querelle was a new direction for Fassbinder, maybe it was just one of those throwaways he would undertake in the midst of his three-or-four-movies-per-year pace and signifies nothing beyond that. (Except: Each man kills the thing he loves, la-di-da.) In any case, it was rendered with absolute confidence, like every other movie he made.